Today at the headquarters of the Islamic Educational, Scientific and Cultural Organization (ISESCO) in Rabat, the 7th Islamic Conference of Environment Ministers closed with the adoption of many documents and projects that aim to activate environmental protection and promote sustainable development in the Islamic world. In this regard, the Conference adopted the Report of the 4th Islamic Executive Bureau for the Environment and urged the Member States to complete the appointment of focal points for the Bureau to facilitate the follow-up to the implementation of the decisions, resolutions and recommendations of the Executive Bureau and the Islamic Conference of Environment Ministers. It also adopted the Report of the Director General on ISESCO’s Efforts in the Field of Environment and Sustainable Development between the 6th and 7thICEM Sessions. In addition; commended ISESCO’s efforts devoted to the implementation of the programmes geared towards Environment Protection and Sustainable Development; and invited ISESCO Director General to pursue these efforts, in coordination and consultation with the OIC General Secretariat, the Member States’ competent parties and the national, regional and international specialized bodies, in such a way as to achieve sustainable development goals. By the same token, the Conference adopted the Report on ISESCO’s Efforts in the 22nd Conference of the Parties on Climate Change and Preparation of the 23rd Session of the Conference and lauded ISESCO’s efforts devoted to activating the “Islamic Declaration on Environment Protection and Sustainable Development. It also lauded the Organization’s efforts in enforcing the resolutions of the Conference of the Parties to the UNFCCC (COP), through the implementation of relevant programmes and activities for the benefit of Member States; commended its contribution to the preparation for and participation in the COP22 held in Marrakech and urged the Member States to engage in further joint action for activating the relevant conventions pertaining to climate change and to the mitigation of its effects; and to take practical measures likely to ensure the necessary adaptation in this regard. Further, the Conference adopted the “Progress Report on the Creation of the OIC Water Council and its Terms of Reference”; commended the efforts put by the OIC General Secretariat and the Islamic Conference of Ministers Responsible for Water towards creating this Council, developing its statutes and defining its terms of reference and working mechanisms; invited the Member States to support this Council in the implementation of water-related programmes in such a way as to enhance water resources management and climate change adaptation in the Islamic world. Likewise, it invited the OIC General Secretariat and ISESCO to coordinate water-focused joint Islamic action in order to uphold the Council’s action in light of the “Strategy for Integrated Management of Water Resources in the Islamic World” and the “OIC Water Vision 2025”, in such a way as to contribute to ensuring water security for Islamic countries. In another vein, the Conference adopted the Progress Report on the Creation of the Islamic Academy for the Environment and Sustainable Development; thanked the Kingdom of Morocco for its sustained efforts towards the implementation of this major academic and developmental project, as well as for the administrative and technical measures taken, within the framework of the new conception of the Academy, towards providing its headquarters and developing its organizational structure and action programme; and invited the competent party in the Kingdom of Morocco to coordinate with ISESCO for pursuing the necessary practical measures for the creation of the Islamic Academy for the Environment and Sustainable Development. 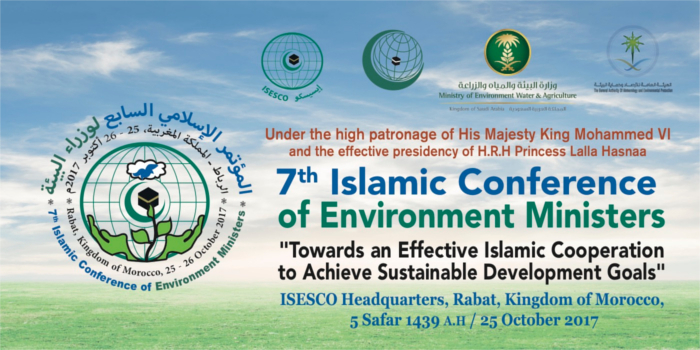 In addition, the Conference adopted the Report on “the Kingdom of Saudi Arabia Award for Environmental Management in the Islamic World”;reiterated thanks and gratitude to the Custodian of the Two Holy Mosques for the creation of the Award and for his kind consent as to expanding its scope to cover the Islamic world and entrusting its General Secretariat to ISESCO, in order to entrench the broad concept of environmental management and promote sustainable development in Islamic countries. It also hailed the efforts exerted by ISESCO and the General Authority of Meteorology and Environmental Protection of the Kingdom of Saudi Arabia to effectively launch this Award in the Islamic world, starting from the current edition of 2016-2017 and commended ISESCO’s role in assuming the General Secretariat of the Award, undertaking the organizational and technical arrangements for the implementation of its media plan, and ensuring the academic and technical supervision of the submissions assessment process, in cooperation and coordination with the General Authority of Meteorology and Environmental Protection of the Kingdom of Saudi Arabia. In another vein, the Conference agreed that a new category under title “Honoring the Best Environmentally friendly Islamic City” be added to the Award’s four categories in a bid to encourage the development of green cities in the Islamic world in line with the Guidance Document on Green Cities and their Role in Achieving Sustainable Development. The Conference also adopted the updated version of the “Report on the Creation of the Joint Committee on the Executive Work Plan for Natural Disaster Risk Reduction and Management in the Member States” and adopted the proposal made by the Islamic Executive Bureau for the Environment to set up the Joint Committee on the Executive Work Plan for Natural Disaster Risk Reduction and Management in the Member States, composed of the OIC General Secretariat, ISESCO, Islamic Development Bank, the General Authority of Meteorology and Environmental Protection of the Kingdom of Saudi Arabia, and the Global Facility for Disaster Reduction and Recovery, under the supervision of the Islamic Executive Bureau for the Environment. In the same vein, it adopted the Pilot Programme on Capacity-building in Natural Disaster Risk Reduction and Management in the Member States for 2018-2019 and invited the OIC institutions concerned to cooperate with the Joint Committee to convene an Expert Meeting in order to define Member States’ priorities and capacity-building activities in line with the said Pilot Programme, and submit a report on the subject to the Eighth Islamic Conference of Environment Ministers. Further, the Conference commended the efforts being made by the Member States towards achieving sustainable development within the framework of their regional and international commitments, and invited them to continue their efforts to implement the resolutions of the 7th Islamic Conference of Environment Ministers in such a way as to respond to the needs, priorities and public policies of the Member States in this area. In another vein, it called for building on the “Guidance Document on Green Cities and their Role in Achieving Sustainable Development Goals” in the development of relevant national plans; commended the ongoing efforts in the Member States having opted for sustainable urban planning and development, and urged the rest of Member States to prioritize sustainable urban development in their national policies and take the necessary legal measures to regulate green building projects, in line with the best international practices and in anticipation of the steady growth of cities in the decades to come. By the same token, it recommended fostering cooperation and exchange of successful experiences in green urbanization and enhancing the climate resilience of existing cities, and invited Member States to adopt smart and sustainable city policies in building, energy, transportation, waste recycling and water use, protect forests and prevent their exploitation for urbanization purposes, and build the capacities of local governments in this field. Moreover, the Conference adopted the Report on “the Creation of an OIC Joint Commission for Sustainable Development (OIC-CSD)” and called for merely activating the existing relevant OIC and its affiliated institutions’ mechanisms with regard to directing joint Islamic Action efforts towards encouraging sustainable development among Member States, and working towards highlighting these efforts within the UN System, the regional and international forums as well as specialized conferences on environment and sustainable development, in order to achieve sustainable development goals and enable the neediest Member States to benefit from the expertise and potential available in this field. Likewise, it adopted “the Programme on the Celebration of Islamic Capitals of Environment and Sustainable Development”, taking into consideration the observations of the Conference members and called on Member States to adhere to this Programme and work towards taking the necessary measures for making their cities environmentally friendly as per the “Guidance Document on Green Cities and their Role in achieving Sustainable Development Goals”, and in line with the best international practices in this field. It welcomed the endeavors of the Executive Director of the UN Environment Assembly to dispatch a qualified team of international experts to conduct a field study on the state of the environment in the occupied Palestinian territories, including Eastern Al-Quds, pursuant to the request submitted by the State of Palestine, and in accordance with the procedural guidelines of environmental assessments and called on the Executive Director to act towards dispatching the abovementioned experts team to conduct the said study in the event of a refusal by the Israeli occupation authorities to cooperate by issuing a written approval to facilitate the team’s mission and its entry to the occupied Palestinian territories, including Eastern Al-Quds and invited the competent parties to support this resolution in the relevant international forums in appropriate ways. In conclusion, the Conference decided to hold the 8th Session of the Conference at ISESCO headquarters, in October 2019 and thanked the Kingdom of Saudi Arabia for allocating a fixed budget for the convening of each session of the Islamic Conference of Environment Ministers and the Islamic Executive Bureau for the Environment.